Record up to 16 channels of 24-bit/96kHz live audio simultaneously. The stage has its own life, its own energy. No two shows are ever alike, and that's part of the fun. What if you had the power to easily capture all that magic and bring it to everyone who couldn't be there? What if you could record your performances, and mix it yourself afterward to get exactly the sound you want out of the recording? The Tracker MT16 makes it possible. 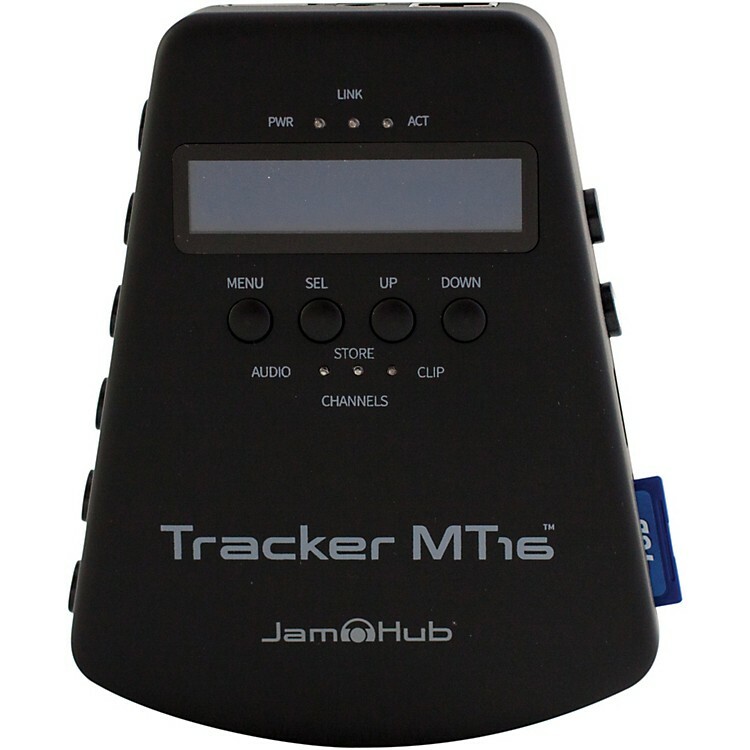 Go beyond the microphone taped to the wall with JamHub's Tracker MT16 multitrack recorder. This portable recorder lets you connect directly to almost any mixer or JamHub studio for 16 channel multitrack recordings that feature each musician on their own track, without affecting the house sound at all. Record incredible audio, up to 24/96, in WAV or MP3, so all your files drop seamlessly into your favorite DAW for post-production. And starting in June 2014, you'll be able to use the Tracker MT16's built in WiFi to start and stop your recordings from any iOS device with the free Tracker MT16 Control app. We make music to share with the world. Tracker MT16 makes getting a great product easier than ever by letting you record everything in multitrack and mix it yourself after the show. Record. Mix. Publish. By taking the audio from the mixer and setting all the levels yourself, you get live recordings that your audience will love and listen to over and over. Record your show tonight, have it up on the web tomorrow. Never worry about the quality of your recordings again. The Tracker MT16 gives you the freedom to take pride in everything you do, whether its capturing live audio for the web, CDs, video, or podcasts. With the Tracker MT16 Breakout cable (sold separately) you can seamlessly connect your recorder to the insert jacks of any mixer to record multitrack files of all your live gigs without the hassle of traditional gear. With a streamlined JamHub Connect jack on one end, and 16 specially designed ¼³ jacks on the other, the Breakout cable plugs directly into the mixer's insert jacks to record clean post-trim, pre-fader audio that is unaffected by the room or the house mix. Connect directly to any JamHub studio using the JamHub Connect cable (included). The Connect cable plugs your Tracker MT16 directly into the remote port on the back of any JamHub studio, and allows you to record each stereo section as its own independent file for convenient post-production. This simple option turns your JamHub studio into a powerful 5 or 7 section recording and monitoring platform. On the sides of your Tracker MT16, you'll find 8 built-in inputs, which are convenient for connecting any mixer or line-level output to record high quality multitrack files. You can even plug your line-level instruments directly in or use a simple preamp with your mics, then just arm the tracks and record without any complicated gear! Your Tracker MT16 saves everything to a standard SD card, making it easy to take your files with you and get them into your computer, but the fun doesn't stop there. Using the integrated USB port, you can record directly to an external hard drive or computer without ever having to worry about buffering or running out of storage space. Never miss a magic live moment again!